Passages to the Past is very pleased to be hosting Alana White today with an interview and giveaway of her novel, The Sign of the Weeping Virgin! 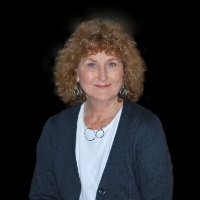 Alana is currently on a virtual tour with Historical Fiction Virtual Book Tours, you can find the full schedule of stops at the bottom of this post. The interview questions have been provided by Audra from Unabridged Chick. What an interesting question! I wrote a coming-of-age story about a young girl growing up in the Smoky Mountains in 1949. So, it was a historical novel. She and another girl argue about whether or not Rhett Butler returns to Scarlett O'Hara at the end of Gone With the Wind (my protagonist is a romantic who is absolutely convinced that he does, the other girl pronounces he certainly does not, but she has her reasons.) So, my protagonist writes to the author, Margaret Mitchell, for the definitive answer, an answer she and the reader receive at the end of the book. It's called Come Next Spring, and it's still in print. I have to write at the start of the day; after that, it's even harder. I don't set a word goal. But I do face the page at least five to six hours a day. And I am always thinking about Guid'Antonio, his frame of mind, and what he is up to. I also spend time taking notes from any new research I may have acquired. Was The Sign of the Weeping Virgin the original title of your book? Yes. And I'm pleased to say my publisher never mentioned changing it. As you were writing The Sign of the Weeping Virgin was there a particular scene or character that surprised you? Place as character -- in this case, Florence -- is an important element in your book. What's your favorite sight/building/vista in Florence? I have to say Ognissanti Church. I feel close to Guid'Antonio there. And when I look at Botticelli's Saint Augustine, I look up and try to see the written clue that solves the mystery in the book. Also, the Medici Palace and the chapel therein, where Guid'Antonio talks with Lorenzo de' Medici's mother, despite his apprehension that she blames him for her son's death. Again, the palace and chapel are open to the public. The chapel holds Gozzoli's Adoration of the Magi, as described in the book. This question caught me truly by surprise. I had to think about it! I love estate sales. Pondering that made me realize why: they take me back to the time of my grandmother. I'm from the South, and sales here usually involve antiques such as Shaker furniture, cast iron pots, and so on. They take me home, somehow, though I often find them sad. Someone loved these items, cherished them. And so, I almost always purchase a little something, even if it is only a lacy handkerchief, in that person's memory. It's hard to get past Hilary Mantel's Wolf Hall and Bring Up the Bodies. Love, love, love those books! And for the Historical Novel Society, I reviewed The Sadness of the Samurai, by Victor del Arbol, which I admire for the writing and the story set in 20-c. pro-Nazi Spain. That's an arena I am not at all familiar with, and I enjoyed it especially for that reason, I think. The year is 1480, and celebrated Florentine lawyer Guid’Antonio Vespucci and his nephew, Amerigo, return home to Italy from a government mission to find their dreams of peace shattered. Marauding Turks have abducted a beautiful young girl and sold her into slavery. Equally disturbing, a revered painting of the Virgin Mary is weeping in Guid’Antonio’s family church. Angry and fearful Florentines interpret these stunning events as signs of God’s wrath for their support of the city’s leader, Lorenzo de’ Medici, and Lorenzo’s refusal to end his war with the Pope. Faced with losing control of the city, Lorenzo enlists Guid’Antonio, his friend and staunch political ally, to investigate the tears. In an evocative tale that brings the Italian Renaissance gloriously to life, following a seemingly unrelated trail of clues–a name whispered in the marketplace by a hooded monk, a secret message painted by Sandro Botticelli on the wall of the Vespucci family church–Guid’Antonio and Amerigo chase across Florence to the workshops of Leonardo da Vinci and Sandro Botticelli, to churches where frescoes seem to fly off the walls, from Florence to the village where the girl disappeared, and, finally, to the hilltop of Vinci itself. 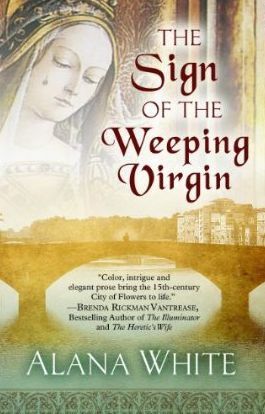 In The Sign of the Weeping Virgin, a finely wrought story that will appeal to lovers of medieval and renaissance mysteries everywhere, Guid’Antonio uncovers the thought-provoking truth about the missing girl and the Virgin Mary’s mystifying–and miraculous?–tears, all pursued as he comes face to face with his own personal demons. Alana White’s fascination with the Italian Renaissance led to her first short historical mystery fiction, then to a full-length novel, The Sign of the Weeping Virgin, forthcoming from Five Star Mysteries in December 2012. Set in Renaissance Florence, The Sign of the Weeping Virgin features lawyer Guid’Antonio Vespucci and his adventurous young nephew, Amerigo Vespucci, as they investigate crime in Renaissance Florence. Alana’s articles and book reviews appear regularly in Renaissance Magazine and the Historical Novels Review. In young adult+ books, she is the author of Come Next Spring, a novel set in 1940s Appalachia, and a biography, Sacagawea: Westward with Lewis and Clark. She is currently working on her second Guid’Antonio Vespucci mystery. Passages to the Past has one hardcover copy up for grabs. To enter, please complete Rafflecopter giveaway form below. Giveaway is open INTERNATIONALLY and ends on February 28th. Good Luck! Great answers! Fascinating about Francesca (she was great -- I didn't know women were doctors then!) and I'm delighted she'll be more greatly featured in the next book. Thanks, Amy, for hosting this interview and thanks to Ms. White for her thoughtful responses! great interview. Never been to an estate sale, but always wanted to. My mom would it. congrats on the book, and the setting of Florence is gorgeous. Never been but it's on the bucket list.